Create a whole lot of fun memories that last for a lifetime. Five action packed days of winter fun include various arctic adventures, snowmobiling, skiing, elves, tame reindeer, nice huskies and Angry Birds. And of course, you get to meet the gentle 300-year old man in red, Santa Claus. After a day full of arctic marvels it is time for a good night’s sleep under the starry skies and flaming auroras experienced through the glass roof of your family’s very own aurora cabin. Everything is taken care of. Warm clothes – we got them. Breakfast, lunch, dinner, snacks – served. Transfers – of course, from the airport to the airport and to all activities. Don’t worry about a thing, just relax and join the fun! 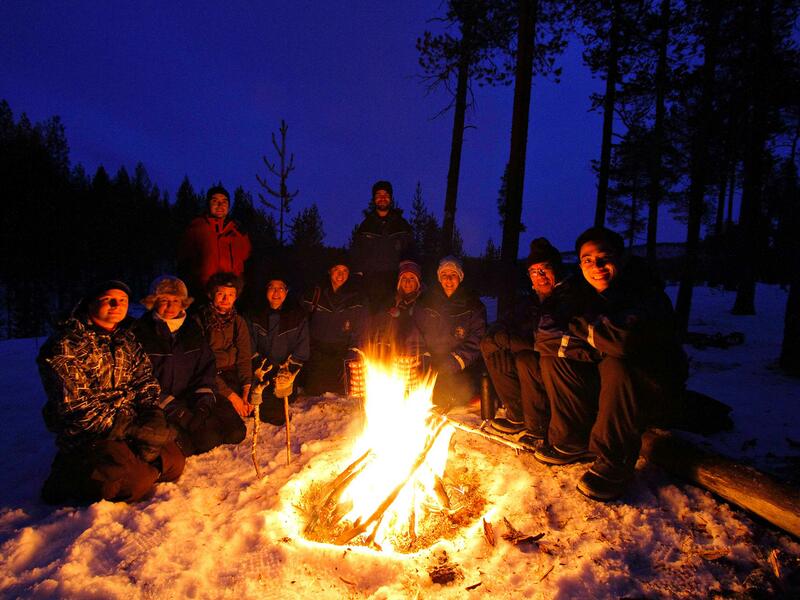 The winter in Lapland offers a wide variety of thing to do with kids. How about some snow sports? In the Cross Country Ski School you will learn to be the king of the ski tracks. Have you ever tried snow shoes – or children’s snowmobile? And regardless of your age, you should really try out the amazing, over 1-kilometre long toboggan ride (longest one in Finland). All of our high-class activities are suitable for all family members. Family Package includes a Reindeer ride and a Husky safari through the wintry forest. In the evening you get to hunt the northern lights all the way up the fells in a heated sledge pulled by a snowmobile. The children get to bake gingerbread cookies with an elf and in the Searching for Santa -activity they meet the man Himself in his secret cabin in the woods. Another sure hit with the kids is the Angry Birds Theme park visit. And so that it wouldn’t be all ice and snow, you also get to relax in the warm saunas and pools – a Spa visit is included in the package. PHOTOGRAPHY ORIENTED: Our talented guides will take photos during all guided activities and sent them to you with no extra charge! So that even after years your family won’t forget the slightest detail of this memorable vacation. Free day – possibility to try Finland’s longest toboggan hill ride, ride Kids’ snowmobile, visit shops in Saariselkä or book additional activities or aurora hunts, sauna, massage or other services. Breakfast and dinner in restaurant Kota.